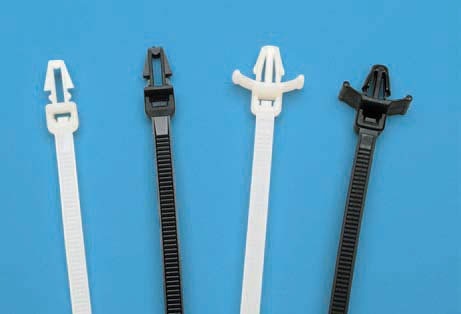 Push Mount Cable Ties | Push Mount Plastic Zip Ties | Cal Fasteners, Inc.
Push mount cable ties make mounting bundled wires or cables to a panel or other surface quick and easy. Special flexible pegs protruding from the cable tie heads pop into place for a secure connection. For added stability, some models feature tensioning wings which extend sideways from the head. Cal Fasteners stocks push mount zip ties, with or without tensioning wings, in 40 and 50-pound capacities and in multiple lengths to meet your needs. Natural nylon, black nylon, UV-treated black nylon, and heat-stabilized black nylon models are available. Unique pawl, teeth, and transition rail designs and one-piece construction help improve tensile strength. Finger grips and tapered tails make handling and alignment easy. Low insertion and pull through force make these push mount cable ties easy to tighten and install. ROHS compliant. We also offer standard 40 and 50-pound capacity zip ties. Request a quote on push mount cable ties for your application, or contact Cal Fasteners to learn more.